I have just returned from Scotland where I spent a week at St. Andrews for the British Open and another week touring Scotland with my wife Marcia. My three favorite golf courses in the world are St Andrews, Augusta National and Pebble Beach. I have been to all 3 this year and it doesn't get any better than that! 4U client Ben Crane played really well. The bad news is he caught the wrong end of the draw. He was on the course Friday during the ferocious wind that caused a suspension in play. He double bogied 11, 12 and 13 prior to the horn sounding. The other 15 holes he shot 2 under that day. That's golf!!! There is simply no place quite like St Andrews. You feel the history, you feel the ghost of old Tom Morris and young Tom Morris, and you can feel Arnold Palmer and Jack Nicklaus walking across the Swilcan Bridge. I had the privledge of walking inside the ropes with Ben Crane Sunday, Monday, Tuesday and Wednesday prior to The Open beginning on Thursday. Sunday his practice round was with Tom Watson. What a thrill! 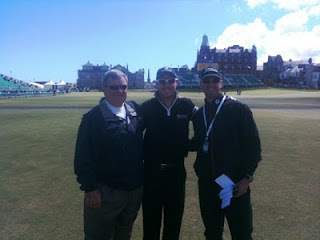 Tom talked about how "St. Andrews is a hard course to understand. You have to relearn and relearn and relearn it all the time". He too got caught up in the heavy winds and the bad draw and later said "The old lady doned her boxing gloves." It is amazing to stand on the 17th tee and watch Tom hit six tee shots trying to decide whether to hit a 3 wood or driver over which "O" in "The Old Course Hotel" based on wind conditions. When I think of the British Open, I think of St. Andrews.